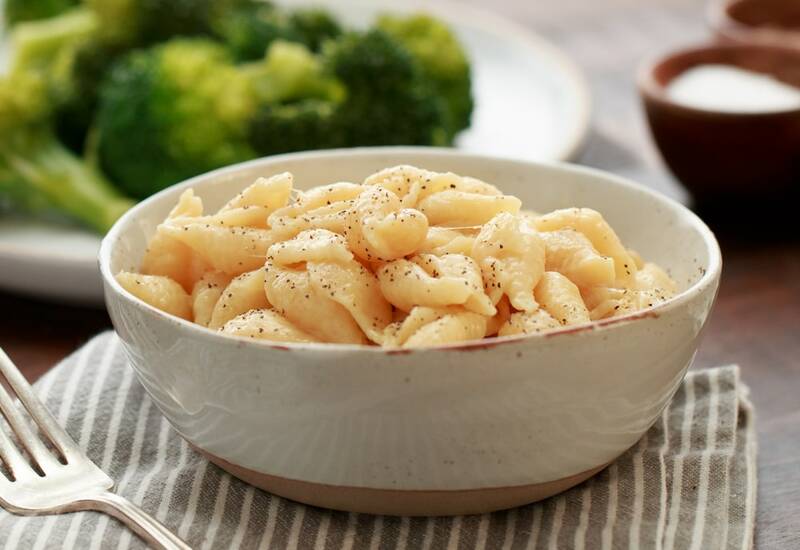 Mac and cheese has never been so delicious or so easy from scratch as it is with your pressure cooker! Simply cook the pasta in the pot for four minutes then stir in the cheese and half and half to have a delicious, low-effort, and satisfying bowl of everyone's favorite comfort food. The best part of this dish (besides the cheese)? It's fully customizable -- you can mix and match different cheeses to get your ultimate cheesy flavor that you love! Stir pasta, water (or stock), butter, salt, and garlic powder together in inner steel pot of pressure cooker. Lock pressure cooker lid in place and set steam vent handle to Sealing. Select Pressure Cook (manual) and cook on High Pressure for 4 minutes. Turn steam vent handle to Venting to quick-release pressure. Remove lid and press Cancel. Select Sauté. Stir half-and-half into pasta and bring to a simmer. Stir Cheddar and Parmesan cheeses into pasta and cook until cheese is melted and incorporated, 2 to 4 minutes. Press Cancel and let pasta sit until sauce thickens to your desired consistency. Ladle into bowls and top with parsley, panko, and black pepper as desired. Water works just fine with this recipe but chicken or vegetable stock will bring the flavor up even more. If you want to get crazy, use your favorite cheeses, as just about any cheese will work in this dish! Just remember to grate or shred the cheese fresh from a block as it will melt better and more consistently. Per Serving: 477 calories; 30g fat; 30.1g carbohydrates; 22g protein; 85mg cholesterol; 1612mg sodium. I used regular elbow noodles which was only 12 net weight ounces but still followed the recipe as is for liquid and cooking. I only added 1/2 cup of milk since it looked more liquidity then the video but everything came together at the end when I had all the cheese added. I used 2 different kinds of sharp and Parm. I even snuck in an avocado. The toddler ate 3 bowls. Love this recipe!! So much easier then doing it from scratch and tastes like it’s from scratch. Definitely use chicken stock as it gives great flavor. I also like to put fresh thyme leaves and pepper. My husband who’s a picky eater and only loves food made fresh, loves this Mac and cheese! My husband and I love it! I made half and half since I didn’t have any on hand, and used mostly the correct cheeses, although I used a cup of Mexican blend when I ran out of cheddar. So delicious, quick, and easy! My only issue was that the pasta foam went everywhere when I released pressure. I’m new to pressure cooking so is that normal or did I do something wrong? This would have been excellent if I’d halved the salt, I made it w bone broth. I have been looking for a mac and cheese recipe with zip for a long time now. I have finally found it with this recipe! I used elbows and I used "Better than Bullion" chicken base instead of the liquid broth which I believe really made the difference. I didn't add the salt since bullion has plenty of salt as does the cheese. I wound up using a little more half and half (probably because I used slightly more cheddar) and added a big dollop of sour cream. It is so delicious!!! I told so many people about it and offered to use my Mealthy Pot for friends that I know will like this, since I am not feeling like sharing! DEFINITELY will make again! ENJOY!!! This is so good and easy! I used chicken stock and agree it definitely adds a whole new level of flavor. Used Irish cheddar and Romano cheese, and added in lobster meat for a decadent twist! Added fresh parsley and more pepper and let it all sit for awhile after sautéing. This is a keeper and next time I make it, may throw in some spinach and some pepper flakes. This sure isn’t boxed Mac n cheese! We added sauntered Weber cooked ham and used Gruyere and white cheddar cheese. Instead of garlic powder we used Everglades Seasoning. Totally awesome flavor combination. Thanks “Deer Meat for Dinner” You Tube channel for introducing us to Everglades. Delicious, easy, versatile! I added sundried tomato and arugula... loved it!